Since 2009 ICAMS operates a high-performance computing cluster. It is the most important tool for the ICAMS scientists to perform high throughput calculations. 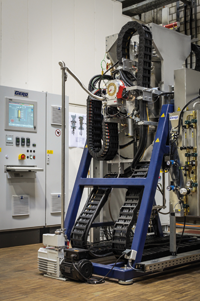 Since 2014 ICAMS operates together with the institute of materials a Bridgman furnace. The furnace will be used for the investigation of solidification processes and for the production of single-crystal samples. It can be operated up to 1650°C, and the whole melting apparatus can be rotated though angles of up to 180°. It is thus possible to vary the angle between the gravitation and solidifications direction. Furthermore, high temperature gradients can be obtained through liquid-metal cooling using gallium-indium. The furnace is funded by the DFG through a Scientific Instrumentation – Information Technology (Großgeräte) grant.